The high quality adhesion of the concrete surface creates an ideal bond with the adjacent in-situ concrete, i.e. "concrete in concrete". BIRCO additionally supplies Type I and Type M channel systems in accordance with DIN EN 1433. Depending on the type, this means that load-bearing foundations and/or concrete casings are not needed on the building site. And this reduces complicated, expensive casing work. BIRCO only uses high quality 4 mm solid steel frame connectors with a 70μm zinc coating or frame connectors made of stainless steel. Massive anchors stably connect the frame connectors with the concrete channels. This makes it possible to conduct sealing of the base courses directly at the channel/frame connector edge when laying BIRCO concrete channels. That creates the optimum connection with the very best de-icing salt and corrosion protection. 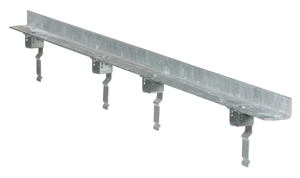 BIRCO channel systems are fitted with a solid steel combi-connection frame connector. This allows all types of gratings and coverings to be bolted to the channel panel up to 8 times per metre, or fastened quickly and securely with the BIRCO Easylock option. BIRCO creates individual fastening solutions for special requirements. BIRCO frame connector casings make cleaning the threading easy. Removal or replacement of the grating works smoothly over the long term.